Former New York City Mayor Michael Bloomberg is donating $1.8 billion to his alma mater to help students with financial aid. The donation is designed to make the private research university in Baltimore both need blind and loan-free. "Need-blind" means the school will no longer take financial need into account during the admissions process, instead focusing solely on the merit of the applicant. "Loan-free" means the school will no longer package loans in their financial aid award letters, replacing that money with scholarships that don't need to be paid back. Bloomberg — who earned a bachelor's degree from Johns Hopkins in 1964, using federal student loans and a campus job to help pay his way — went on to urge donors both big and small to focus their philanthropic efforts on financial aid. With this program, Johns Hopkins will join a host of other schools that don't take financial aid into consideration when admitting students and that have made the no-loans promise — including Brown University. Initiatives that offer full financial aid or no-loan options are aimed at making colleges more affordable and accessible, but it's important to remember that elite colleges enroll a much smaller number of students than public four-year and two-year schools. And the percentages of low-income students on these campuses is very small — just 3 percent of enrollment at highly selective colleges according to the Jack Kent Cooke Foundation (which is a financial supporter of NPR). At Johns Hopkins, the median family income for students is $177,300, and just 6.6 percent of undergraduate students come from middle- or low-income families in the bottom 40 percent, according to an analysis by the New York Times. "This reflects a failing to live up to the Jeffersonian ideal of equal opportunity," Ronald J. Daniels, president of Johns Hopkins University, told NPR. "There should be pathways for students from lower-income backgrounds to apply to a place like Hopkins." In terms of increasing economic diversity on campus, easing the burden of tuition only goes as far as the number of low-income students who apply and get in. There are lots of reasons why smart low-income students don't apply to elite schools, including undermatching — when students apply to less selective schools — lack of college advisers in high school, and uncertainty (and sticker price shock) surrounding the cost of tuition. "We know that we're going to have to get more creative and aggressive in reaching out to those students," said Daniels. "This program will allow us to do that." In addition to helping more students afford Johns Hopkins, the money will go to supporting students when they enroll and to helping to even access to supplemental experiences like research, internships and study abroad. Johns Hopkins University in Baltimore will get the largest-ever individual donation to a single university - $1.8 billion. 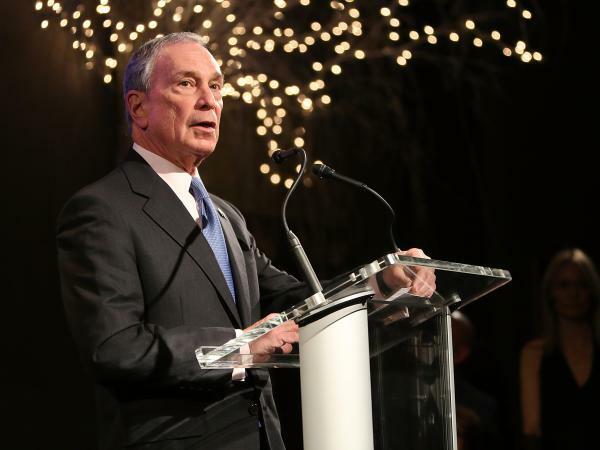 It's from an alumnus, the former New York City mayor and philanthropist Michael Bloomberg. He announced the donation yesterday and said the money is for financial aid for undergraduates from low- and middle-income families. Elissa Nadworny is following the story and joins us now. Hi, Elissa. ELISSA NADWORNY, BYLINE: Hey, Ari. SHAPIRO: How is Johns Hopkins going to use this money in admissions? How is it going to change the university's policies? NADWORNY: So the money will allow Johns Hopkins to focus solely on merit during its undergrad admissions process. It's actually been doing that for the past several years, but this will allow it to have the financial backing to do it permanently. So the school won't have to take a student's financial need into consideration when offering admissions. They're also committed to meeting full need for students, so that includes eliminating loans from their financial aid packages and replacing those loans with scholarships that students won't need to pay back. SHAPIRO: Explain why this school is so focused and Bloomberg is so focused on need-blind admissions. NADWORNY: So the goal is to increase economic diversity on campus. NADWORNY: Well, schools see value in diversity of thought, so having students from different backgrounds helps make that happen in the classroom and on campus. And elite schools have struggled to diversify and bring in kids from lower-income families. So right now on elite college campuses, low-income students represent just 3 percent of enrollment. SHAPIRO: Is there any kind of a forecast of what that 3 percent would become if need-blind admissions were a reality? NADWORNY: You know, there isn't a forecast, but we do know that for schools that have gone need-blind with full financial backing, yes, it's increased diversity on campus. Hamilton College in upstate New York is a great example. But need-blind policies only work if there's money to back it up, so it's not a realistic option for a lot of schools with low endowments or small financial aid packages. I spoke with Justin Draeger. He's the president of the National Association of the Student Financial Aid Administrators, and he's explaining how this fits into kind of the usefulness of how to encourage low-income students on campus. JUSTIN DRAEGER: But this is really just one tool in the toolbox of things that a school would use to try to diversify their students. It's not going to be the panacea or the silver bullet that's going to automatically diversify your population. SHAPIRO: Tell us about some of the other tools in that toolbox 'cause most schools are not about to get a $1.8 billion donation. NADWORNY: Yeah, well, recruiting is a big one. So recent research found colleges tend to recruit at richer, whiter high schools. So, I mean, you could have all the money in the world to give students once they get in, but if they're not applying, you know, it doesn't matter. So we also know that lots of high-achieving students - they don't apply to these selective schools. Some - they think they can't get in, or maybe they won't be able to afford it if they do get in. There's also lots of poor schools that don't have college counselors. Or maybe they have one college counselor for a couple hundred students, so they can't adequately advise students on where they should apply. SHAPIRO: Do you expect that this one big donation to this one university is going to have a bigger impact on access to college in general? NADWORNY: Yeah, I mean, we'll see. If there's a trend of donors giving to financial aid instead of, say, putting their name on a big building, like, it could potentially open up access. But it's important to note that most students who are going to college aren't going to elite schools like Johns Hopkins. Most are at public, four-year and two-year universities. And state funding for those institutions is way down. Across the country, it's now about $7 billion lower than it was before the recession in 2008. So that means public schools have less money to go towards things like financial aid. SHAPIRO: That's NPR's Elissa Nadworny. Thanks a lot. NADWORNY: Thanks, Ari. Transcript provided by NPR, Copyright NPR.